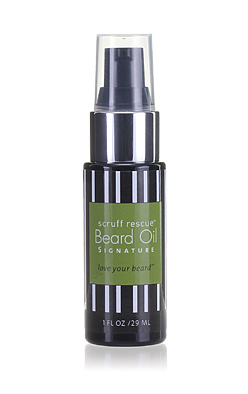 Scruff Rescue Beard Oil Signature aroma naturally nourishes, moisturizes and softens beards, moustaches and the underlying skin. The fresh clean aroma is from organic tea tree, lemon tea tree and other pure essential oils. 100% botanically based, silicone-free and packed with whisker-softening phytonutrients. Scruff Rescue Beard Oil relieves the itchy scruffy side effects from starting stubble all they way to maintaining a perfect moustache, soul patch, goatee or full beard. Our signature scent is now new and improved. • Fresh clean natural aroma pairs perfectly with our Scalp Rescue hair products! The amount of Scruff Rescue Beard Oil to use depends on the texture and length of your facial hair. Squirt an appropriate amount into your palm, lightly rub palms together then apply evenly to clean whiskers. For longer beards massage product to distribute oil evenly. May be used with dry or slightly damp, towel-dry beards to lock in moisture. For external use only. Avoid eyes. Vitis Vinifera (grape) Seed Oil, Buxus Chinesis* (jojoba) Seed Oil, Ricinus Communis (castor) Oil, Cedrus Atlantica (atlas cedarwood) Essential Oil, Styrax Tonkinensis (styrax benzoin) Resin, Citrus Bergamia (bergamot, bergaptene-free) Essential Oil, Eugenia Caryophyllata (clove) Bud Essential Oil, Pelargonium Graveolens (geranium) Essential Oil, Lavendula Angustifolia* (lavender) Essential Oil, Rosmarinus Officinalis* (rosemary) Essential Oil, Calendula Officinalis* (calendula) flower extract), Mixed Tocopherols (plant derived GMO-free vitamin E).